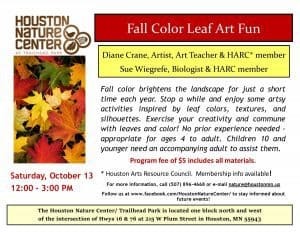 Fall Color Leaf Art Activities! For after-hours maintenance, contact City Hall at 507-896-4033 or county dispatch non-emergency at 507-725-3379. Copyright © 2019 Houston Nature Center. All Rights Reserved. | Website design & hosting by Vision Design Group, Inc.